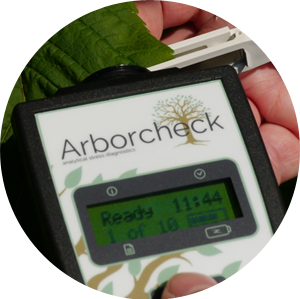 Chlorophyll fluorescence is a measurement of far-red light that is re-emitted from within the leaf itself. This light is a dissipation of energy that could not be used by the leaf in the early reactions of photosynthesis. An increase in the intensity of chlorophyll fluorescence indicates the presence of stress factors that are limiting the trees ability for optimum photosynthesis. 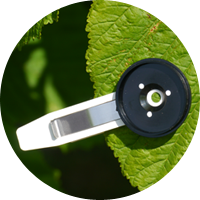 Chlorophyll content is a very simple optical measurement which provides a reading of relative chlorophyll content. Stress limits the amount of carbohydrates available for growth and reduces nutrient uptake resulting in leaf chlorosis and necrosis. Exact knowledge of foliar chlorophyll concentrations, i.e. leaf greenness, consequently helps to provide a robust and accurate estimation of tree vitality. 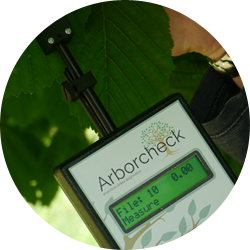 Both instruments are non-invasive, non-destructive and allow measurements to be taken directly on the tree in situ. Each measurement takes no more than 1 second to complete.